adidas’s marketing pitch: Versatile running shoes with a seamless mesh upper and flexible cushioning. Upper: Engineered mesh, inner sleeve, TPU frame, fused urethane. 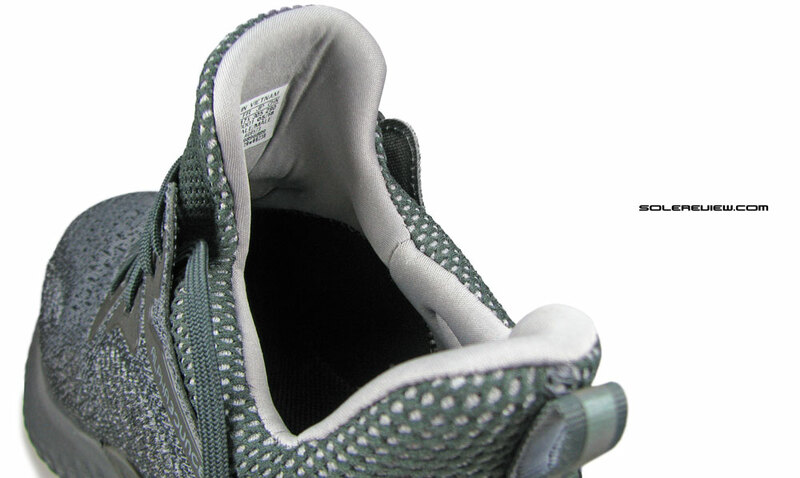 Midsole: Soft foam core inside a firmer EVA midsole casing. 10 mm heel to toe drop. Outsole: Single piece of grippy Continental rubber. 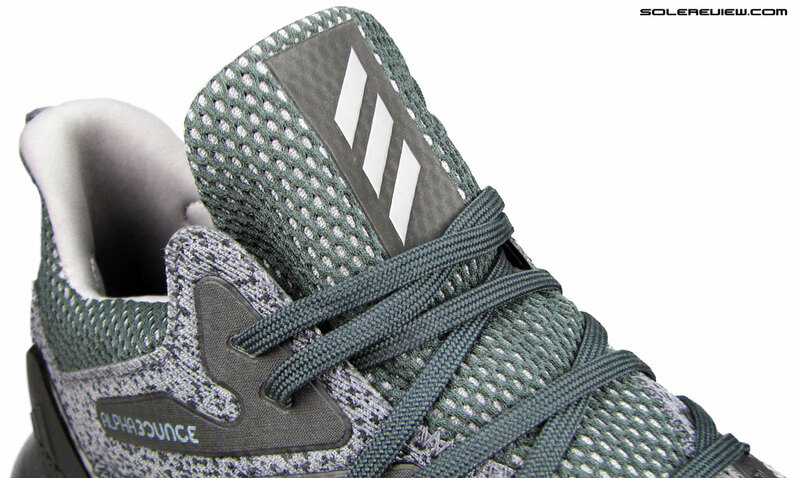 The first generation Alphabounce wasn’t much of a performance running shoe, and the Beyond edition is more of the same. But when viewed purely as an athleisure product, this is one of the best $100 shoes you can buy. These days, a $100 retail price gets you a shoe with a flimsy looking upper slapped over a single-density foam midsole. It matters very little whether the category in question is performance running or athleisure; most shoes follow a homogenous design template. If you’ve seen one, you’ve seen it all. The new Alphabounce Beyond goes against the tide, and that’s the reason why it is probably one of the best $100 athleisure shoes you can buy today. We reviewed the original Alphabounce nearly two years ago and gave it a relatively low score because of its shortcomings as a performance shoe. adidas markets the Alphabounce as a running shoe, but what if we ignored that and reviewed the shoe for what it truly is? After all, a review becomes far more purposeful when expectations are managed. 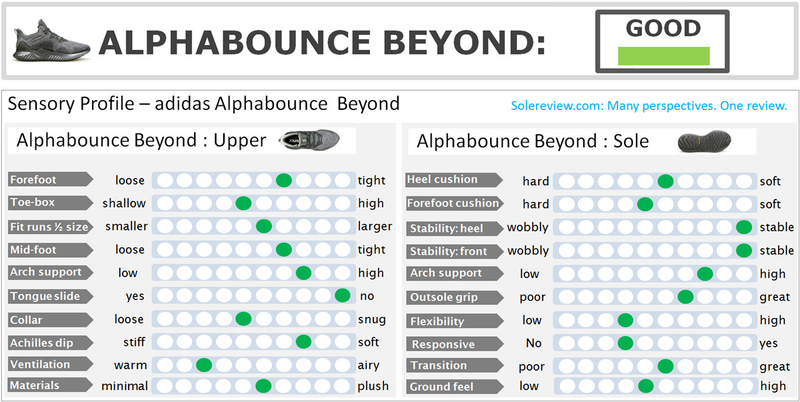 Solereview doesn’t recommend the Alphabounce beyond as a performance running shoe. But if you’re looking to buy a running shoe inspired silhouette with a comfortable fit, a cushioned and supportive ride, plus a grippy and durable outsole, then this is one of your best options. And it’s not merely the functional attributes which make the Alpha a good casual shoe buy. For a shoe which retails at $100, there’s a surprising high level of detailing and materials. The entire package is premium enough to belie its retail price, with no evident signs of cost-cutting. In fact, many of adidas’s $150+ shoes look cheaper in build quality than the Alphabounce. There’s enough richness on the Alphabounce to help one remember what made us fall in love with footwear in first place. The kind of love which makes choose a career in the footwear industry or become a full-time shoe reviewer. The kind of love which nurtures the unbridled enthusiasm of a shoe geek who looks forward to every new release. So that’s how we’re viewing the Alphabounce Beyond for this review. We will judge it not by how it performs on a 10K but how it does when used as a daily casual-use product. So for this shoe, we’ll follow the old solereview format with plenty of pictures and minus the infographics (except for the scorecard). The midsole and outsole is a good place to start. The Alphabounce uses a softer foam core encased within a firm and supportive outer midsole. There’s no Boost here, just different densities of EVA foam working in tandem. The midsole has a very distinctive design; its sidewalls flare out extremely wide along the entire length of the shoe. We can’t recall any other shoe with a such a wide base. And it’s not just the sheer width of the midsole – the mid and rearfoot is supported with a humongous plastic frame. The under-frame hugs either sides of the midfoot and then extends upwards to clasp the heel. 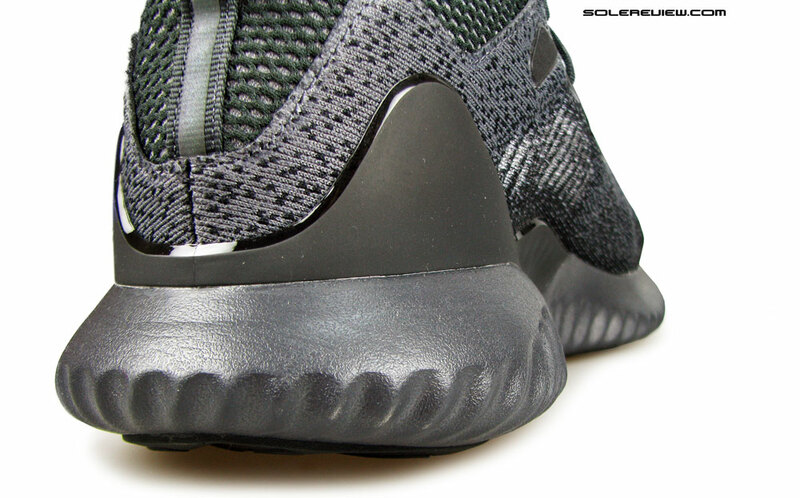 The Alphabounce’s heel lacks an internal counter but that would have been totally unnecessary. The rigid clip and the thick upper combine to perform the role of an external heel counter. 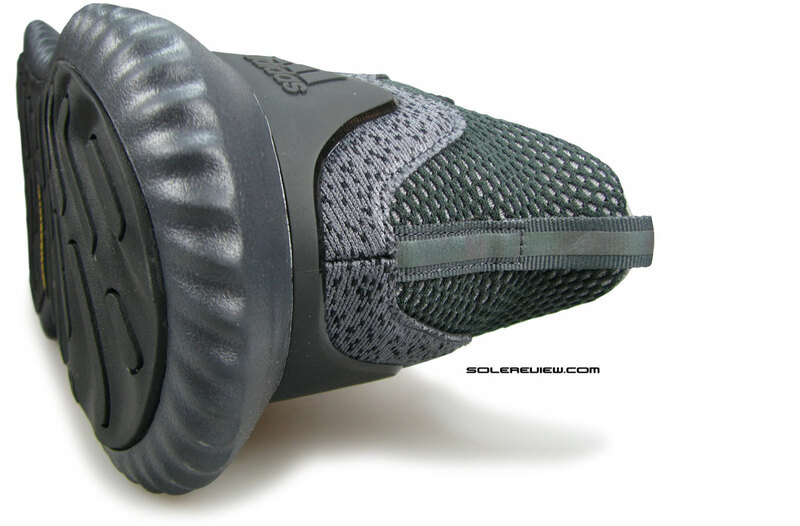 Compared to the first generation Alphabounce and its different variants, the Beyond model has a much larger heel clip. 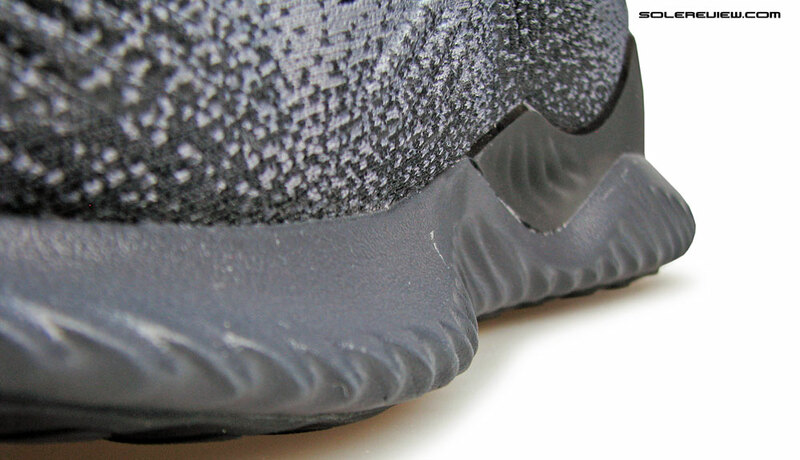 On the first Alphabounce, the functionality of the TPU clip was limited. That isn’t the case here – the frame is an integral part of the Alphabounce’s structure. Just this once, adidas has used plastic judiciously and where it’s needed. This part also adds aesthetic depth to the midsole design – it merges seamlessly with the molded ridges of the midsole sidewall and enhances the overall aesthetic appeal. 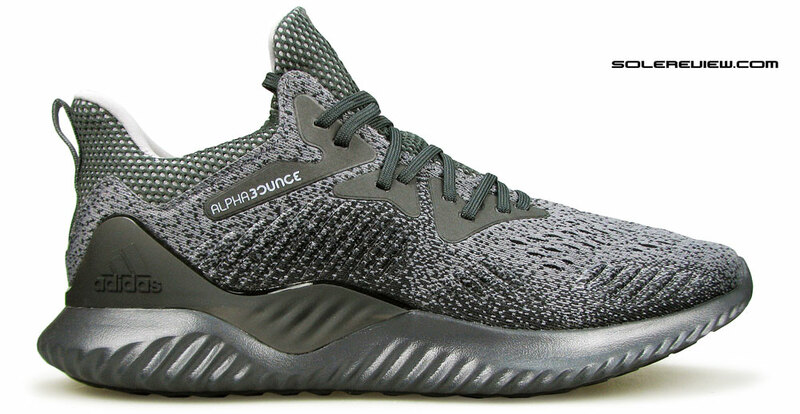 The aforementioned construction makes the Alphabounce Beyond one of the most supportive sports-lifestyle shoe available on the market today. The combination of the firm midsole, the TPU under-frame, and the flared outrigger provides a super-stable foundation. This is also a suitable choice for users who like the sensation of under-arch support. 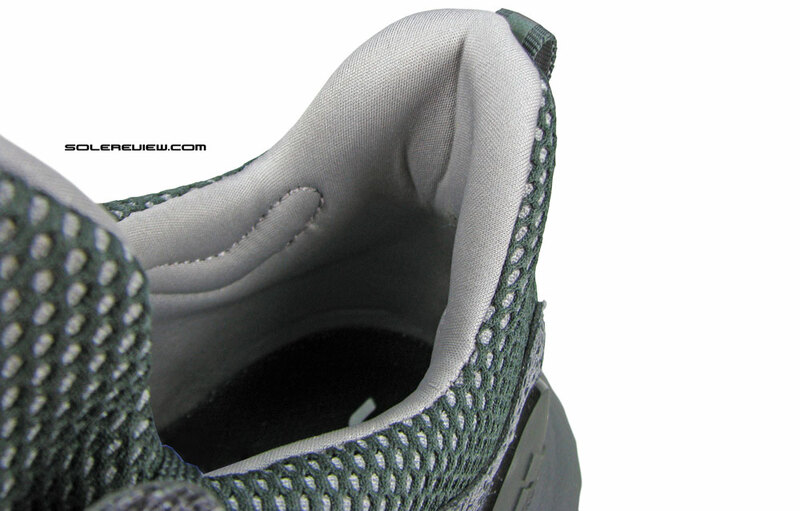 As you can see in the image above, the edge of the TPU frame and the midsole hug the underside of the arch. 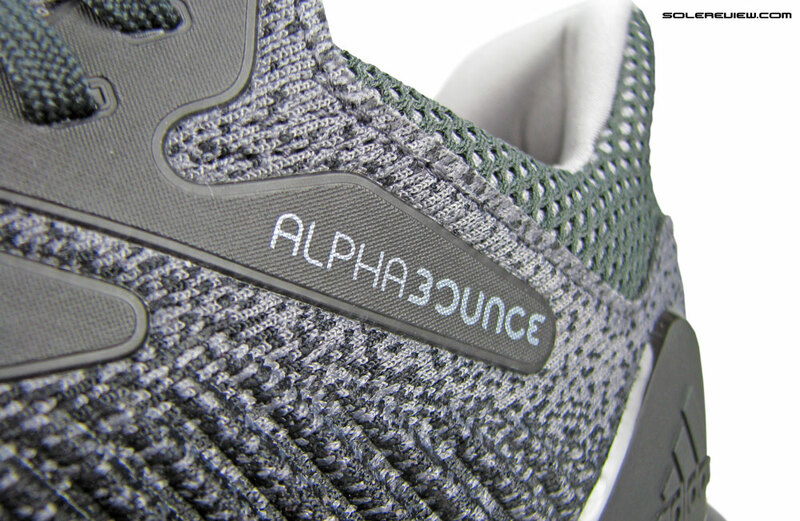 Because of its firm base, the Alphabounce works great for heavier users (200 lbs/90 kilos and up). Durability is also excellent, courtesy of the Continental rubber outsole. The Alpha B’s outsole is covered with a large sheet of Continental rubber which provides a superlative grip over most surfaces. 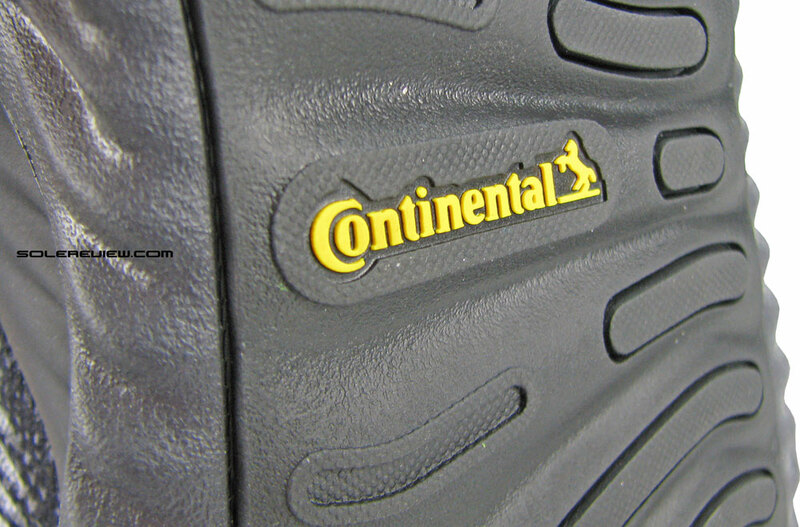 This is the Continental rubber outsole’s second outing on this model. 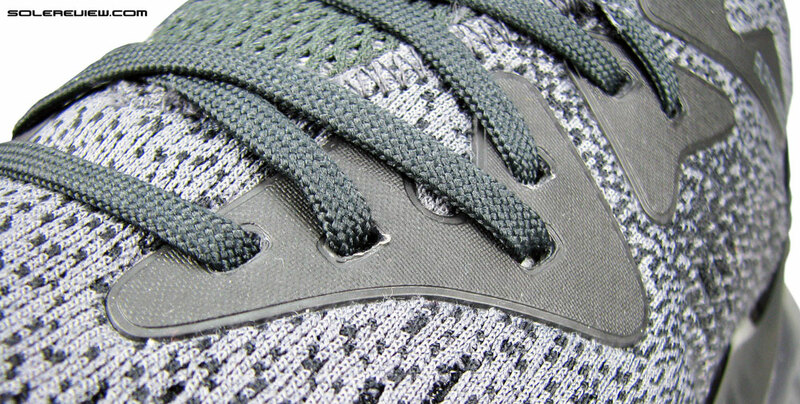 The Alphabounce 1 (not to be mistaken with the first Gen) had an aggressive trail geometry; the Beyond has a layout which appears to be inspired by tire threads. The outsole looks like it’s set flush into the midsole but is slightly elevated to prevent midsole scuffing. The term ‘Bounce’ in the shoe’s name is misleading. All of the Alpha B’s cushioning softness is delivered by the soft core placed inside the firm midsole. So the sense of softness is very centered instead of a uniform spread. At best, the ride quality is of a comfortable medium-soft level. The Alpha B has a removable insole and a foam lasting underneath it, but it is pretty thin and isn’t a major contributor to the cushioning softness. The insole is set extremely flush inside the shoe so you’re likely to mistake it for a non-removable kind. And given the type of foam material (EVA based), there’s nearly no spring-back. But then again, we’re judging this shoe based on the standards of a lifestyle shoe. So if you’re looking for Boost or Floatride levels of softness, the Alphabounce won’t give you that. What it has is a moderately cushioned but extremely supportive ride. The midsole is firm with no flex grooves underneath, so the forefoot isn’t very flexible – contrary to what adidas claims. But it suffices for daily casual use. The Alphabounce Beyond’s upper is a design evolution of the first generation model. It’s constructed in a bootie design, which means that the heel collar and the tongue are joined in a sock-like design. 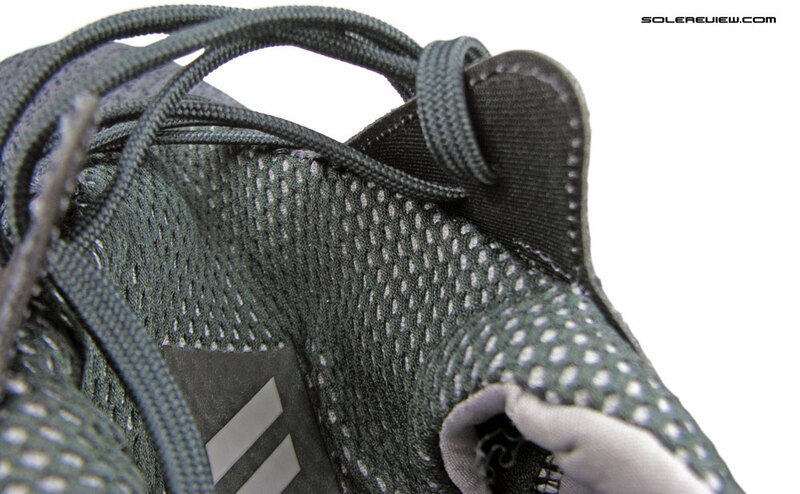 The heel and tongue lining use the same material with similar levels of foam padding. 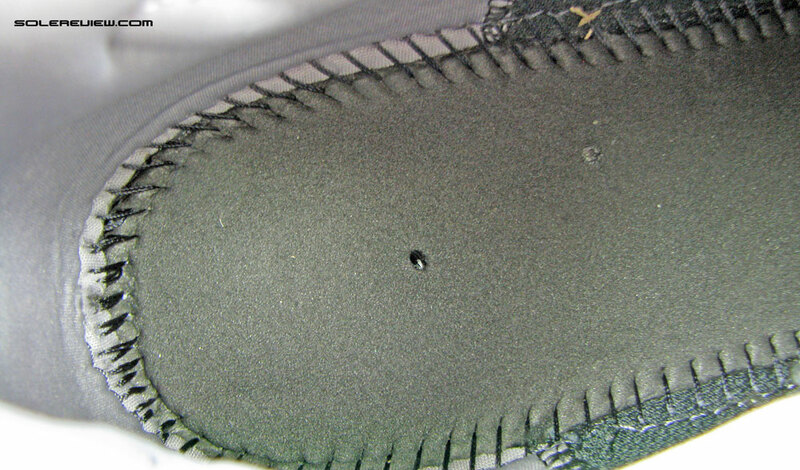 The inner heel area has stitched ‘pockets’ for better grip, and they work well. When used for low-intensity activities, there’s no heel slippage. And thanks to the TPU frame, the heel back is supportive even in the absence of an internal counter. A word of caution for people with extremely wide feet, though. 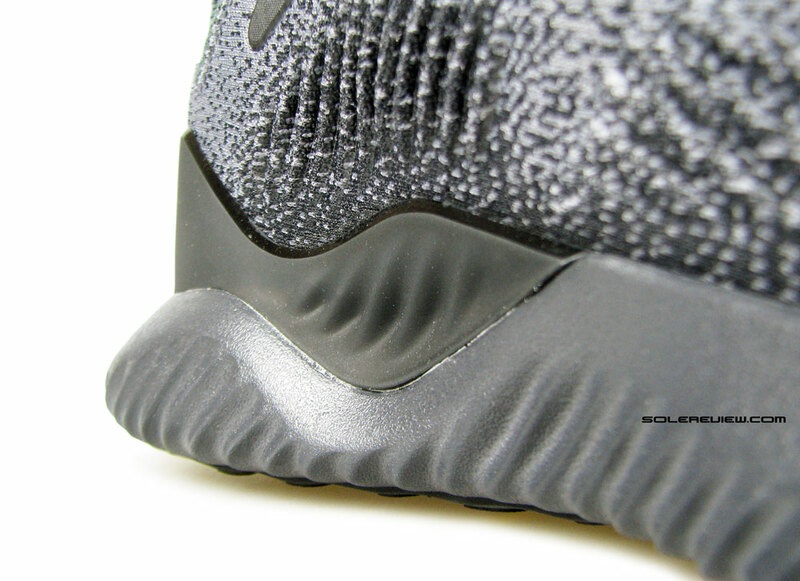 The opening of the Alphabounce doesn’t stretch much so it’s going to be a struggle for people with a high step and a broad foot waist. This observation applies to the larger sizes (US 11+) as well. For regular feet, it’s easy to slip the Alphabounce on and off. The lip-shaped Achilles area doubles as a pull tab too. That makes you wonder why does the shoe need a separate pull tab at all. Maybe it exists just for the reflectivity because the strap has a lot of it. Besides, from a styling point of view, a complete pull strap looks better than cutting it short at the top. One of the first-gen model’s distinct visual features was the molded rib(s) on the mesh. The Alpha-B has those too, except that it’s in selective locations. The forefoot and midfoot sides have molded ridges which not only help enhance the visual appeal but act as support structures. Without the molded ridges, the shoe wouldn’t look as streamlined as it does now. 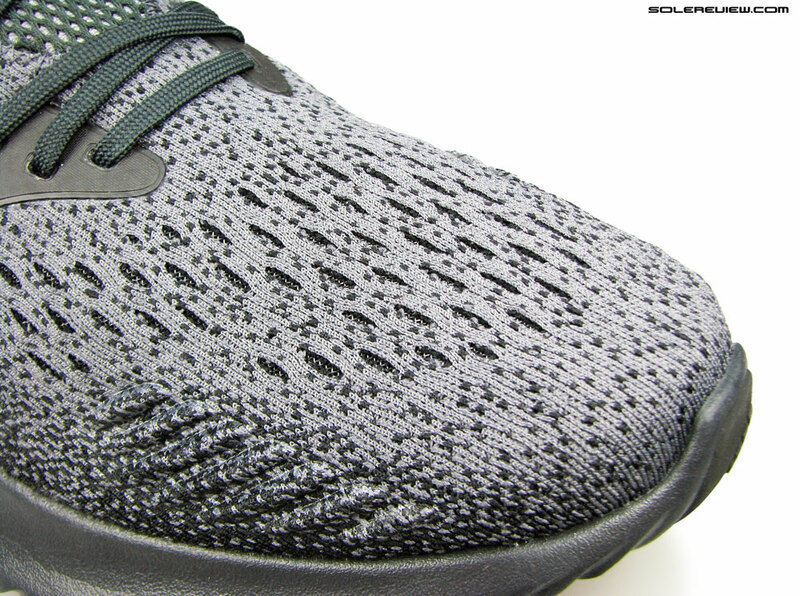 The midsole sidewalls are ribbed as well; this ties in the design elements together. The interiors are a pretty warm place to be in. Because of a full inner sleeve, the upper is double layered. So if a breezy fit is what you’re after, the Alphabounce will disappoint. 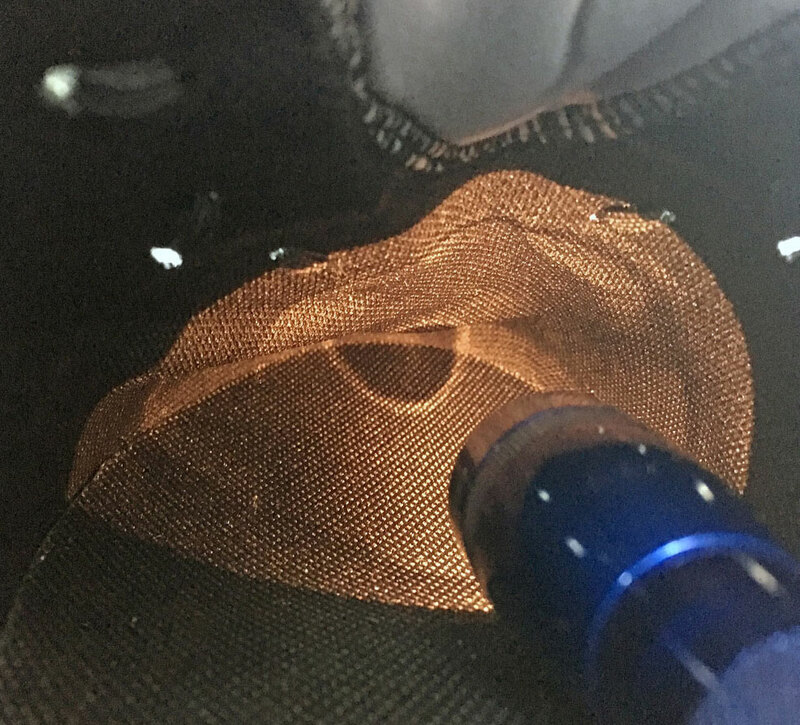 Sure, the outer mesh is an engineered kind with pores but circulation is hampered by the inner sleeve. A thumb rule of determining a shoe’s ventilation (or the lack thereof) is very simple. If the mesh lets the light through, then air will follow. In the Alphabounce’s case, the interiors were so dark we had to place a Maglite torch inside to get a decent shot. As far as the upper fit goes, the Alphabounce Beyond has just the right amount of room. The shoe fits true to size, and the toe-box and forefoot have decent room for splay. The toe-box height is just right too. Though the mesh lacks stretch of any kind, the upper doesn’t feel constricted. Except for the warmth, the fit is comfortable for all-day casual use. The midfoot fit is slightly adjustable through the laces which are anchored by the fused urethane overlays. As is typical of most shoes with a sock-like upper, the laces do not pass completely under the tongue, just over it. Regardless, some change in the fit quality can be achieved by tightening the laces. But there’s a hard limit to doing that; considering that the tongue is a part of the upper, over-cinching of the laces will lead to a gathering of materials. Adidas retails a second variant of the Alphabounce Beyond, one which uses different mesh and a tonal color fusing – just in case you’re looking for a lighter color. It’s fairly obvious that the Alphabounce is a fashionable gathering of mesh and foam which feels great to look at, lasts long, and is comfortable over and under the foot. So what happens when you use the Alphabounce as a performance running shoe? 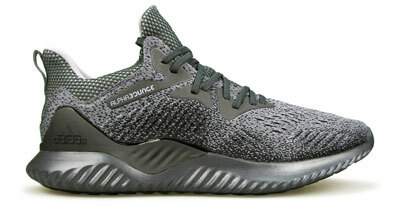 The shortcomings described for the first-generation Alphabounce also applies here. The insides run warmer than a performance trainer and the shoe is 12-ounce heavy. The upper fit, while comfortable, isn’t what you would want in a serious running shoe. As long as you respect the Alpha’s limits as a performance product, you can get away with the occasional short run. But then, there are far better shoes to run in, and you should appreciate the Alphabounce Beyond for just what it is – a comfortable and a beautiful looking casual shoe.